These handcrafted vessels offer a lifetime of joy. It’s not only the delicious produce you can make with them; it’s the way they look right at home on your bench. Emma became hooked on fermentation in 2015 when she attended an Intro to Ferments workshop with Sharon Flynn from The Fermentary. As she lugged home a 15 litre brown crockpot, Emma set herself a challenge to design a small, elegant ceramic crock for today’s modern family. Her limited edition sauerkraut crock * drew on Sharon’s knowledge of fermentation, her own aesthetic and intuitive way with clay, and Jim’s skills in the workshop. Other projects soon followed, including the kombucha on tap crock, fermenting weights, the kimchi crock and the mini /miso crock. More projects are in the pipeline. Contact Emma and Jim if you’d like a ceramic solution to your fermenting project. A set of 3 weights to fit inside a standard Ball Mason jar. 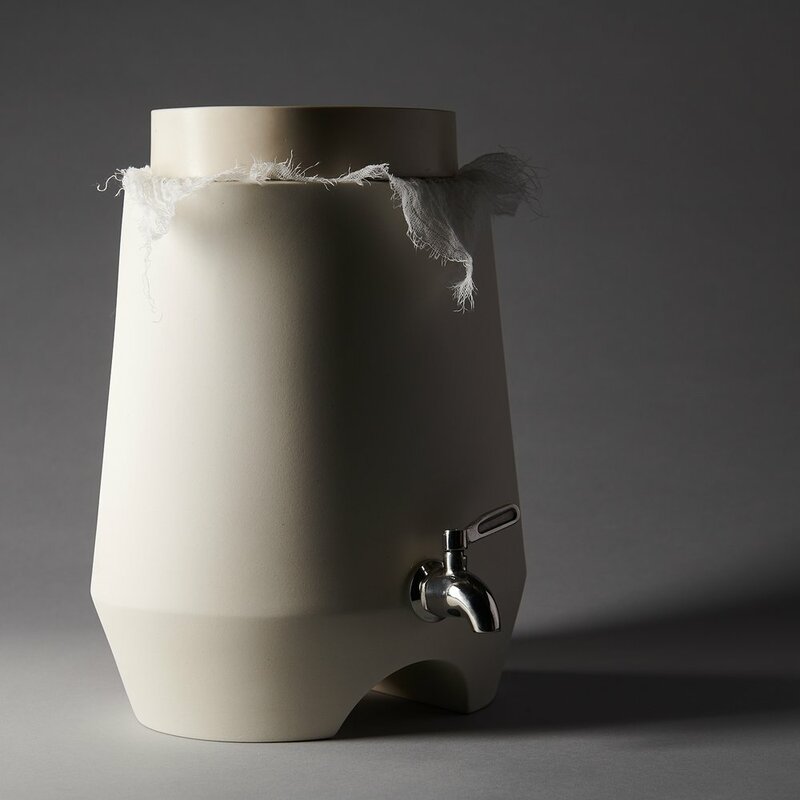 The handcrafted porcelain crock has been designed to be beautiful and functional. It incorporates an inbuilt airlock that is filled with water; to allow the gas produced in fermentation to bubble out and stops the outside air from coming in to potentially ruin your batch. Of course it can be used to brew anything that is better fermented with an airlock. Please contact us if you would like to customise your crock to suit your surrounds. 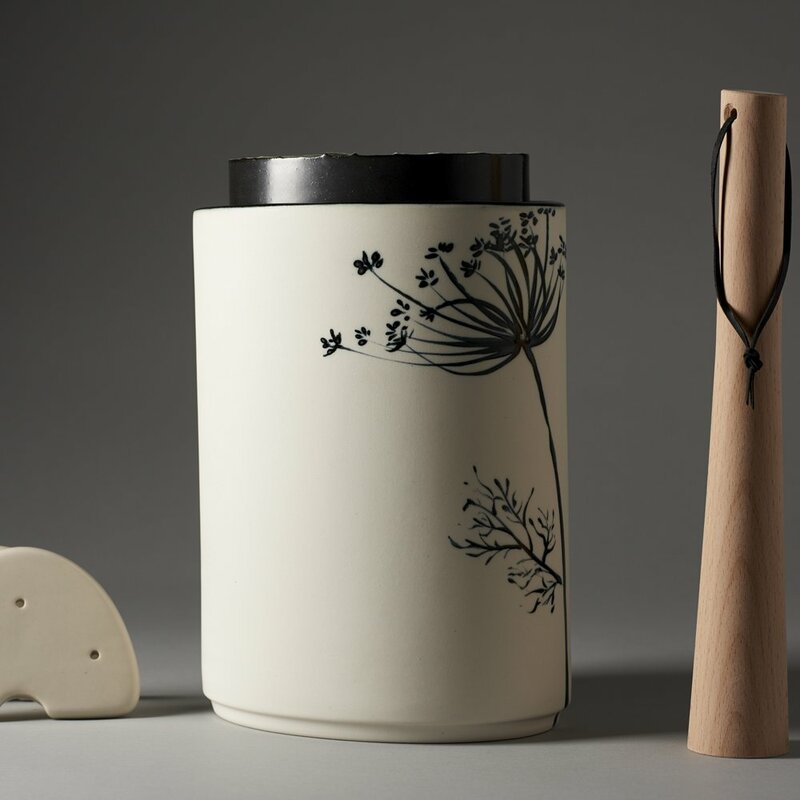 The handcrafted porcelain crock has been designed to be beautiful and functional. It incorporates an inbuilt airlock that is filled with water; to allow the gas produced during fermentation to bubble out and stops the outside air from coming in to potentially ruin your batch. Of course it can be used to brew anything that is better fermented with an airlock. The crock is glazed inside with a clear gloss and comes with custom weights hand-built in stoneware clay. A suggestion from fermenting legend Sharon Flynn had us engineer the lid to cleverly cover the inbuilt airlock and reduce evaporation from the water well. The crock is glazed inside with a clear gloss and comes with custom weights hand-built in stoneware clay and a beeswax wrap for making miso. The handcrafted porcelain crock is designed to be beautiful and functional. The thick ceramic walls keep your brew at a constant temperature. 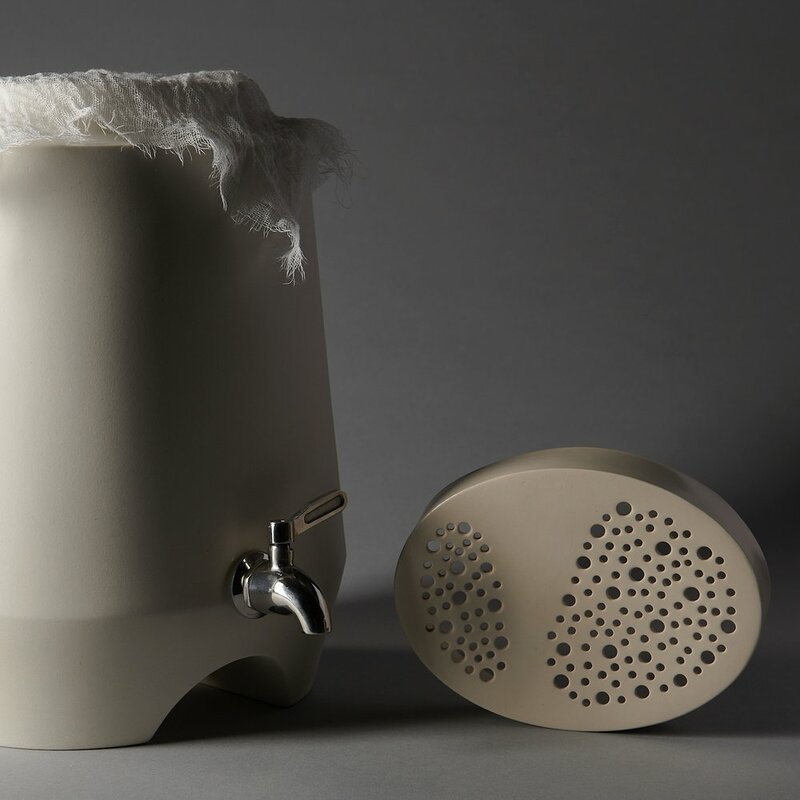 The lid has either holes or cut-outs to give your mother the air she needs to ferment and the high rim under the lid lets you band the muslin to keep the vinegar fly’s at bay. The arch below the tap directs the sediment into the feet, and the tap is set so you always leave enough brew to kick start your next batch. Please contact us if you would like to customise your crock to your surrounds. The crock is glazed inside with a clear gloss and comes with muslin and a stainless steel spigot. Made to fit inside a standard Ball Mason jar to keep your veggies safely under brine. Hand made using stoneware clay. The weights are glazed on top with a clear gloss and come with a calico bag for storing. This pyramid form is the first of many planned to give the modern cheesemaker a choice besides plastic.